Matthew Alford at a recovery of a McLane Moored Profiler. 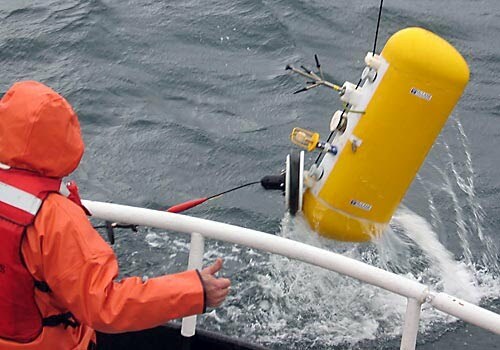 Developed by John Toole (WHOI) and commercialized by McLane Research Labs, this instrument makes repeated vertical traverses of the water column along a conventional subsurface mooring wire while carrying a CTD and an acoustic current meter. We have recently been pushing its limits by sampling extremely fast to study internal waves - and have been modifying the profilers to crawl faster and carry more instrumentation such as nitrate and the Nortex Aquadopp velocity profiler.